To Cite: Ansari H, Almasi Z, Ansari-Moghaddam A, Mohammadi M, Peyvand M, et al. Health Literacy in Older Adults and Its Related Factors: A Cross-Sectional Study in Southeast Iran, Health Scope. 2016 ; 5(4):e37453. doi: 10.17795/jhealthscope-37453. Background: Health literacy can influence physical activity, mortality, self-care behaviors and health outcome for some conditions and diseases especially among the aged population. Objectives: This study aimed to assess health literacy in older adults and its related factors to encourage and inform interventions and the future research outline concerning this group of population in Iran. Methods: This cross-sectional study was conducted on 200 older adults in southeast Iran, during year 2015. The twenty health centers were selected randomly and 10 subjects were selected using multistage random sampling from a population from each health center. The Test of Functional Health Literacy in Adults Questionnaire was used for collecting the data. The data was analyzed using the Stata.12 software using Independent T test, Chi-square test and multiple linear regression. Results: The mean age of the subjects was 62.1 ± 3.9 years (ranging from 55 to 75 years old). The total mean score of health literacy was 64.4 ± 18.4 (range: 12 to 97). The mean score of health literacy amongst males and females was 61.5 ± 19.9 (range: 12 - 96) and 67.1 ± 16.6 (range: 22 - 97), respectively (P = 0.032). About 38.5% (n = 77), 29% (n = 58) and 32.5% (n = 65) of the subjects had inadequate, borderline and adequate HL level, respectively. Bivariate analysis and the results of linear regression analysis demonstrated that monthly income (β = 6.25, 95% CI: 5.03 - 17.27), educational level (β=6.61, 95% CI: 1.78-10.3) and husband’s educational level (β = 5.11, 95% CI: 3.2 - 11.21) were significantly associated with health literacy scores level of older adults. Conclusions: The results of this study showed that generally health literacy level is low among older adults in southeast Iran and needs special attention. The level of education was the most important determinant of health literacy. It seems that the best way to increase health literacy among older adults is health literacy training programs that should be implemented with respect to educational level, gender and income of the individuals. Health literacy (HL) is a measure of the ability attained by individuals to access, recognize, and apply health information to promote positive health decisions (1). Low HL may be acknowledged as a burden to people, affecting access to health services, limiting understanding of health information, and impacting quality of health-related decisions (2). Previous researches have shown that HL can influence physical activity, physical health, mortality, self-care behaviors and health outcome for some diseases such as hypertension and colon cancer (3-6). It must be mentioned that HL is a global issue and according to the statement of the world health organization, HL has a key role in determination of inequalities in both developed and developing countries (7). A meta-analysis study of 85 different studies reported that 25% of the people in United States had insufficient HL, 20% of which had borderline level of HL (8). Another study in the United States showed that 44% and 49% of older adults suffering diabetes and hypertension, have low HL, respectively (9). On the other hand, a previous national study in Iran demonstrated that HL in 56% of the Iranian people is in inadequate or at a limited level. It should be noted that lower HL contributes to an increase in health care expenditure due to less frequent use of preventive health services and weakly managed chronic diseases (10). In addition, people with inadequate HL have a tendency to ask fewer questions of clinicians because of fear and shame associated with this situation (11). On the other hand, low HL has the potential to negatively impact communication with the clinician and staff, reduce the efficiency of health care and eventually affect the care quality and quality of life (10, 11). Therefore, proper health care management requires a partnership between the clinician and patients with greater HL. Otherwise, it is essential for health care providers to understand the role of recognition and promotion of HL to reach the most favorable outcomes. It should be noted that the elderly population is growing steadily and are faced with numerous health problems in societies, especially in the recent years. Furthermore, understanding factors associated with health literacy and paying attention to them could reduce these problems and promote the health status of older adults in all communities (12). In addition to the importance of HL among the aged population, there is no comprehensive study regarding HL of older adults in Iran, especially in southeastern areas. On the other hand, promoting HL among older adults needs the discovery of related factors that have limited information available. Thus, study about HL and their related factors among older adults are very important. There are no comprehensive national studies regarding different aspects of HL in southeast of Iran and also there is the necessity to study about HL and its related factors to depict the situation of this issue in different societies. Therefore, this study aimed to evaluate HL and its related factors in older adults of Zahedan city in southeast of Iran. Due to the lack of data in Iran and this region, the results of this study can also give the base for comparison in future epidemiological studies. This cross-sectional study was conducted on 200 older adults (age ranging from 55 to 75 years old) in southeast of Iran, during year 2015. The twenty health centers of Zahedan city were selected randomly and in the next step, ten subjects were selected using multistage random sampling from the population covered by each health center. The location of sampling starting point was randomly selected on the map of each region. At the starting point for sampling, the first street on the left was selected as the location for sampling. In general, one street was selected from every third street and in total five streets were selected from each region and two alleys in every street was selected randomly. Finally two samples were selected from each alley. Sampling point in each alley was the first house on the right. In case of non-cooperation of one house and/or absence of a person with over 55 years in the household, another person was replaced from the neighborhood. The inclusion criteria were being over 55 years old, having at least elementary level of literacy and living in Zahedan city. Lack of corporation and incomplete response to questionnaires were regarded as the exclusion criteria in this study. The test of functional health literacy in adults questionnaire (TFHLAQ) was used for collecting the data that was used and approved in previous studies in Iran and around the world (6, 13). The validity of the questionnaire was approved with at least 0.83 content validity index (CVI) for every question by 10 experts and the reliability was approved by test-retest correlation coefficient equal to 0.77. The two native interviewers were trained on how to fill the questionnaires and then the inter-observer reliability was checked and approved by Pearson’s correlation coefficient (equal to 0.75) using 30 filled questionnaires by the two mentioned interviewers during two weeks. The questionnaire consisted of two parts including computation and reading comprehension. The computing section examines the person's ability to understand and perform according to physicians’ or other health workers’ recommendations regarding health issues. This section consists of 10 comments or health recommendations about prescribed medicines, the time for referral to a physician, the steps for use of financial assistance and an example about the results of medical tests. These descriptions are available to participants in the form of cards, so that the relevant questions are asked from the person. The total scores in this section is between 0 and 50. In the section of reading comprehension, the ability of the participants is examined regarding reading and understanding three texts including 1) instructions for preparing radiography from the upper gastrointestinal tract, 2) rights and responsibilities of patients in the insurance forms and 3) standard hospital consent forms. In this section the total score is considered between 0 and 50, similar to the previous section. Of the total scores of the two sections, total HL score was between 0 and 100. Finally, the subjects' HL scores were regarded at three levels including, inadequate (fewer than 60) borderline (60 to 75) and adequate (more than 75). At first, the interviewers took consent form the subjects by explaining the goal of the study and emphasizing on confidentiality of their outcomes. They conducted their work under comments of a supervisor. The questionnaires were filled in by interviewers, included demographic variables and questions about HL that are mentioned above. This study was also approved by the ethical committee of Zahedan University of Medical Sciences and the approval number of this project was 6945. The data were analyzed in Stata.12 software using Independent T test and Chi-square test as bivariate analysis. Moreover, a multiple linear regression with Hosmer and Lemeshow method was used to investigate the effect of predicting factors on HL scores among older adults by controlling potential confounders. For quantitative analysis, the normality of the scores was checked and approved by Kolmogorov-Smirnov test. Significance level was defined as P < 0.05. In this study 200 older adults were interviewed. 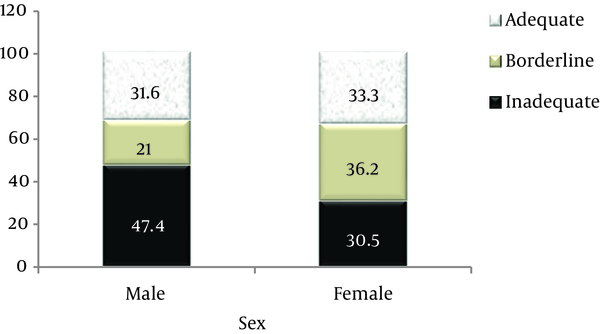 Of all the subjects, 105 (52.5%) were females and 95 (47.5%) were males. The mean age of the subjects was 62.1 ± 3.9 years (ranging from 55 to 75 years old). In this study regarding educational level, 26.5%, 21.5% and 25% of the subjects had finished elementary school, guidance school and high school, respectively. Only 27% of them had academic education. Table 1 shows the distribution of studied subjects based on their demographic characteristics. The total mean scores of HL was 64.4 ± 18.4 (range: 12 - 97). The mean score of HL amongst males and females was 61.5 ± 19.9 (range: 12 - 96) and 67.1 ± 16.6 (range: 22 - 97), respectively (P = 0.032). About 38.5% (n = 77), 29% (n = 58) and 32.5% (n = 65) of the subjects had inadequate, borderline and adequate HL level, respectively (Figure 1). The results of bivariate analysis indicated that HL level was significantly associated with female gender, higher monthly income, higher educational level and there being at least one person with academic education in the family (P < 0.05). The adequate level of HL was higher among females, people with higher monthly income and subjects with high level of education compared to males, people with lower monthly income and subjects with low level of education, respectively. On the other hand, those who had no one with academic education in their family were more likely to have low HL (P = 0.05). The HL level of the older adults was not significantly related to demographic variables including occupation, marital status and age (Table 2). The results of multiple linear regression analysis with Hosmer-lemeshow method indicated that monthly income (β = 6.15, 95% CI: 5.03 - 17.27), educational level (β = 6. 8, 95% CI: 1.78 - 10.3) and husband’s educational level (β = 5.4, 95% CI: 3.2 - 11.21) were significantly associated with HL scores and remained in the final model. In this model the variables including monthly income and educational level was regarded linear. The results of this study showed that, generally, HL is low among older adults in southeast of Iran, so that 38.8% of the subjects have inadequate HL level. Previous studies in Iran and around the world have reported broad range of HL among older adults and other groups. A study in Iran showed that 79.6% of older adults had inadequate level of HL that was much more than the present study (13). Kutner reported that only 3% of the adults in United States have adequate level of HL (14). Another study conducted by Paasche-Orlow reported that 26% of adults have limited HL in England (8). Overall, the results from different studies in other countries show a wide range of low health literacy among different groups in societies. Some studies have shown the inadequate HL level of people to be up to 68% (8). Von Wagner reported that 11.4% of adults have inadequate HL in England (15). The previous national study in Iran demonstrated that HL in 56% of the Iranian people is inadequate or at a limited level (16) that is parallel with the results of the present study in southeast of Iran. Our study showed that only 32.5% of older adults in southeast of Iran have sufficient level of HL that is more than a previous national study in Iran (16). However, the place of study, age range and sample size could explain this difference. The level of education was the most important determinant of HL in this study, so that the highest level of HL belonged to people who had academic education. On the other hand, the level of HL in adults was associated with gender and monthly income. However, low level of HL in males and moderately higher level of HL in older age groups in bivariate analysis, excluding the effect of the two mentioned variables in multiple regression model, approved the actual association of educational level and HL. This result is concordant with a previous national study in Iran (16). National Work Group on Literacy and Health in the United States recommends health content to be written in the level of fifth grade of educational level, but it seems that this level is still difficult for 25% of the population (17). The study of Paasche-Orlow showed that there is no association with low levels of HL and gender (8), but in the present study the level of HL among women was more than men. The gender differences regarding HL level could be due to the fact that the responsibility of Iranian women is low outside their home and they have enough time to attend training sessions related to health issues and classes. On the other hand the importance of health for women is more than men in Iran and thus their health literacy levels is more than men. Regarding the results of this study in bivariate analysis, the higher monthly income could be another predictor for high level of HL among adults and HL level is high among individuals with higher level of monthly income. It seems that most people with higher monthly income belong to groups with higher level of education and they are more interested to get health information and health errands. Otherwise these individuals participate in health related meetings more than others (16). Parker recommended that during clinical meetings, the communication of the physicians with their patients should be according to the patient's actual HL. Some simple techniques for this purpose include the use of simple language, speaking slowly and the participation of family members of the patient in health information exchange (18). On the other hand, non-print media is one of the effective ways to pass health messages to those who have little practical HL. The media may include video and radio tapes, video tapes or computer programs. Even patients with high level of education prefer non-print materials such as pictorial books, video tapes and audio tapes. Generally, assessment and determination of the HL level health in order to design effective methods for information transition to people with low reading comprehension and writing skills is very important for the health system. However, it should be made sure that the people can understand and implement the medical prescriptions regarding their health status. Considering high prevalence of chronic diseases including cardiovascular disease and cancer among elderly population (19), and also due to rising trend of these diseases around the world, the adequate level of HL for participation in different groups in order to participate in the health care system and appropriate health decisions is essential. On the other hand, increasing the HL level of people, could empower them to apply information and instructions about their health (20) and eventually HL directly influences these factors. Thus, low level HL, especially among older adults is a warning to authorities and policy makers. There were several limitations in our study. First, in spite of satisfactory methodology and sampling design method, our findings should not be generalized to all cities in Iran because our sample was derived from southeast of Iran that its atmosphere is different from other universities. Low understanding and abilities of the participants in response to questions was another limitation of the present study. This study approved that the level of education of a person could be used as an independent predictor for his/her HL level. The results of this study show the necessity for more attention to HL in health promotion programs. To reach the mentioned goal and to enhance the level of HL, authorities are required to collaborate with mass media as the most important source of health information for most people. In general, provision of comprehensive programs, development of simple and understandable educational media for people with inadequate HL, could be an effective step for the development of HL skills in the society, especially in developing countries. The authors appreciate the students, who participated in this study. Authors’ Contribution: Hossein Ansari and Alireza Ansari-Moghaddam were project managers and designers of the research. Zeinab Almasi and Mahdi Mohammadi collaborated in the analysis of data and writing of the paper. Mostafa Peyvand, Mahsa Hajmohammadi and Fatemeh Bagheri collaborated in collecting data and prepared the literature review. Funding/Support: This study was financially supported by student researches committee of Zahedan University of medical sciences.